Yoshie delivered a great tour. This is obviously an emotional tour. She connected with each of us personally and went out of her way to make the tour personal. She went way beyond what was expected and took us all the way to Miyajima on the ferry even though that was not part of the tour. This was one of the best tours we have had with Tours by Locals. We would highly recommend Yoshie and this tour. TOUR GUIDE RESPONSE: Thank YOU so much for visiting Peace Park. Folding paper cranes with your parents and your kids was fun. I also enjoyed the conversation with you all. Thank you for sharing good time with me. I hope you enjoy the rest of your time in Japan. Yoshimi is an excellent guide. Her kindness and grace in teaching about the history of Hiroshima was profound. This is a tour not to be missed. TOUR GUIDE RESPONSE: Thank YOU so much for sharing good time with me. I also enjoyed nice conversation with you. Thank you! Thank you Yoshi !!! Your the best !! TOUR GUIDE RESPONSE: Your parents and I enjoyed the best sushi in Hiroshima! Yoshi is an amazing tour guide. She is patient, knowledgeable and fun. She guided our group of 7 friends to the sites on Miyajima and the Hiroshima museum and Peace Park. It was great having a local expert help us quickly navigate transportation and we learned so much about the sites we visited. We all would highly recommend her as a guide. Yoshi in one of the sweetest tour guides you will ever encounter. She has impressive local transport knowledge that makes travel efficient beyond comprehension. She shares knowledge at visited sites in doses that are readily understood in a delicate balance between neither simplistic nor overwhelming. Yoshi is ever ready to take photos and any reasonable request. Her restaurant selections would be the envy of any local. Yoshi is one of the sweetest tour guides you will ever encounter. She has impressive local transport knowledge that makes travel efficient beyond comprehension. She shares knowledge at visited sites in doses that are readily understood in a delicate balance between neither simplistic nor overwhelming. Yoshi is ever ready to take photos and any reasonable request. Her restaurant selections would be the envy of any local. Yoshimi provided an excellent tour during our visit to Hiroshima. She was very knowledgeable and happy to answer our many questions. The tour went beyond the literature and exhibitions you can visit at the site, and having a local provide such a tour really gave us a greater understanding of the subject. I would highly recommend this tour to all visitors to Hiroshima. Yoshi was a great tour guide. She was very knowlegable and her English was very good and easy to understand. She took us to the best Okonomiyaki restaurant for lunch. Yoshi has a very fun personality and made our day very enjoyable. Yoshimi was a wonderful tour guide! She was very knowledgeable, interesting, and courteous. Our day was well planned. We also enjoyed Yoshi's recommendation for a typical Japanese luncheon at a local restaurant. The "Okonomiyakis" - savory pancakes were absolutely delicious!! We thank her for an amazing full day tour and a memorable experience! We highly recommend Yoshimi if planning a trip to Hiroshima. Yoshi is an outstanding tour guide. She guided us through an informative and heartfelt tour of the Hiroshima Peace Park, and provided an incredible depth of information about each building, statue, memorial, and museum. She also expertly guided us through the Shrine and Buddhist Temple on Mayajima island, bringing us to little known spots that others passed right by. Yoshi is friendly yet professional, and a great conversationalist. I highly recommend her as a tour guide. TOUR GUIDE RESPONSE: Thank you very much for sharing good time with me in Hiroshima. After you left, Hiroshima had heavy rain killing many people and destroying roads and rail roads. It was a relief that we had a tour before the heavy rain and you enjoyed the tour. You were in luck! My family of four thoroughly enjoyed our day with Yoshimi. She not only customized a day trip to Hiroshima and Miyajima for us, but she also assisted me with appropriate train schedules. She is very knowledgeable about all of the sites we visited and shared much about Japanese culture. She also suggested a traditional Hiroshima lunch which we might not have otherwise experienced. I highly recommend touring with Yoshimi. We are honored to have spent our day with her. TOUR GUIDE RESPONSE: Thank YOU for sharing good time with me. I really appreciate your visit to Hiroshima. Learning about peace at Peace Park, eating maple cakes, etc, we did a lot that day. I was also wondering if the Japanese sword fit in your suitcase all right. I was very happy to have a wonderful family. Thank you. Ms. Yoshimi picked us up right at our train carriage and was a great guide. We actually came the day of the Osaka earthquake and all the trains were delayed, but that was fine. She kept the interest of our 3 boys through what was a pretty strong experience. She was also patient with our complicated lunch requirements and we had a great trip. She made sure that we made our train back to Kyoto including a race through the Hiroshima train station! Highly recommend. Yoshi was fantastic!!! Very knowledgable, polite, and spoke great english. I highly recommend her to any prospective traveler going Hiroshima. TOUR GUIDE RESPONSE: Thank you for the review and thank you very much for sharing good time with me in Hiroshima. I really enjoyed spending the time with such a nice family. Thank you! We love Yoshimi! She is an excellent guide - very knowledgeable about the history of Hiroshima and the culture. She taught us about everything every step of the way and showed us the greatest spots! We will definitely book her again on our next visit with parents. TOUR GUIDE RESPONSE: Thank you for visiting Hiroshima.The most memorable tour I have had, since I spent so much time to buy tickets, collected information from everyone and learned a lot about tickets. (And heavy fire balls! )The time we spent in the stadium shop was also enjoyable! I am jealous of you because you got replica uniforms before I do! I would love to see you in red uniforms when you come back to Hiroshima. Thank YOU. We extend a big THANK YOU to Yoshimi N for an excellent tour. She exceeded our expectations and was very professional, knowledgeable, kind and patient. She was great in translating and communicating with people. We highly recommend her. Incredible in every way. Our guide was so nice and very smart. We enjoyed every minute we spent with her. TOUR GUIDE RESPONSE: Thank you very much for sharing good time with me. It was fun to make Orizuru paper crane with you! Thank you. Yoshi is a fantastic guide who will expertly keep your group moving without being overbearing. She is extremely knowledgeable, but resists turning your tour into a history lesson. She took the time to understand the sorts of things we wanted to do and see, and customised our tour to suit. A great day was had by experienced and inexperienced travellers alike. We can highly recommend Yoshi for your tour of Hiroshima and surrounds. Yoshimi is amazing! She spent a lot of time with me prior to the trip and she is always on time and have a lot of patience with us. Her knowledge of the country was far superior to anything we experienced in our travels. We have a lot of laughs too! Definitely recommended. TOUR GUIDE RESPONSE: Thank you for sharing good time with me. It rained and was chilly,but it was enjoyable day. Everytime I see a convenience store umbrella, it will remind me of the time I spent with you in Hiroshima. Thank you. Great place and great guide. Yoshi was super kind and inisghtful, making our tour a memorable experience! TOUR GUIDE RESPONSE: Thank you for visiting Hiroshima and thank you for sharing good time with me. I hope visiting Peace Park has inspired your daughter to study true history and I look forward to see her succeed in the field in the future. Arigatou gozaimashita. Excellent tour guide!! Very knowledgeable of the area and the history. She was very passionate about the history and the present day information. I learned more about this place within this tour than I learned in high school!! Best of all, I think my family and I made a good friend! I definitely recommend Yoshimi to anyone. By the way, very good English! TOUR GUIDE RESPONSE: Thank you so much for visiting Peace Park. You have a wonderful family and I really enjoyed being with you. I would love to visit Oahu again! I hope you enjoy your stay in Setagaya ku. Mahalo. TOUR GUIDE RESPONSE: Thank you very much. You must come back to eat oysters! Yoshi was a magnificent host. She spoke great English, was very knowledgeable and did not leave us until we boarded the train. We could not recommend her highly enough. A wonderful lady. TOUR GUIDE RESPONSE: Thank you for visiting Peace Park and for sharing good time with me. You have a wonderful family and I really enjoyed doing the tour for you. Thank you. Yoshimi was an amazing guide for our tour of Hiroshima and Miyajima. She was very knowledgeable about the history of all events and we learned so much from her ! 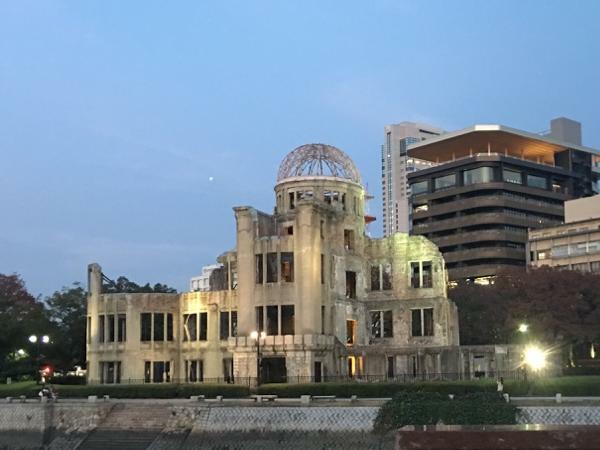 Seeing the museums and memorials in Hiroshima is a must see for anyone touring Japan and she is the perfect guide to explain the history and peace message. Miyajima was magical and she explained the history with perfection. We also enjoyed the Oriziru tower where we learned origami. She was so gracious ! I would highly recommend her !! TOUR GUIDE RESPONSE: Thank you very much for sharing good time with me. You have a wonderful daughter and a wonderful family. I also learned a lot from you. I now would like to study about Civil War and Invasion of Normandy. Thank you!! Particularly enjoyed Yoshi's detailed explanation of Buddhaism (and Shintoism) in connection with an extensive tour of the Daisha-in temple. An unexpected treat was a small boat ride to and through the great "floating" Torii gate in front of the Itsukushima Shrine. Very experienced guide/interesting family. TOUR GUIDE RESPONSE: Thank you so much for sharing good time with me. You brought a nice weather to Hiroshima. This is for your reference. The URL of Toraya sweets; https://www.tokyu-dept.co.jp/ec/l/1C274000000?mediaNo=29008&utm_medium=cpc&utm_source=yahoo&utm_campaign=Seasonal Please enjoy your stay in Miyajima. Yoshimi was a delight. Informative, pleasant and good company. TOUR GUIDE RESPONSE: Thank you for visiting Hiroshima to learn about A-boming. I will continute to tell people history of Hiroshima. Thank you so much for sharing good time with me. Wonderful guide with excellent command of English met us at bullet train station upon our arrival from Osaka, where our ship docked. She took us to the atomic bomb museum and ground zero, giving some personal narrative along the way, as her parents' generation had experienced the explosion. I will never forget this, and I wish all the world could see what happened here. We also visited a beautiful garden and then had lunch in a tiny restaurant that we would never have found on our own. Yoshimi was amazing! We've been on several tours and she was by far the best we've ever experienced! Thank you for such an amazing day in Hiroshima. Highly recommend.We had a great time visiting the Orizuru Tower. Our family made paper cranes helped by our guide. It's hard! We are very grateful that Yoshi shared some personal stories about Hiroshima shortly after 1945.She took us to a great local Okonomiyaki restaurant.Our kids very much enjoyed the evening. She was great! Just what we were looking for. She knows this area and lead us to see the things that were relevant, in a friendly and efficent manner. We were VERY pleased!! I took a lot of tours to Japan and this was one of the best tours I've been on. Yoshimi was a very good tour guid. She was very knowledgeable and fun to talk to. we covered a good amount of things in a short time. If your going to visit Hiroshima you should book this tour guide for sure. Yoshi was perfect! She speaks very good english and knows a lot about japanese culture and could explain us a lot of interesting things! She has lot of knowledge about culture of Japan and etiquette. Great conversationalist. Her personal experience and insight about the life of Japanese and also the war made the tour better. We could not take full advantage of her itinerary due to rains, which she had warned us in advance of. Great guide! We had 8 people and she designed a special tour just for our group. We covered both the Atomic bomb area and Miyajima. Wish we could have spent more time in Miyajima but were squeezing a lot into the one day we had in Hiroshima. Yoshi was very informative and put together a great day for us. Yoshimi was an excellent tour guide. She picked us up at the bullet train station and accompanied us to the Hiroshima peace park/museum. She was knowledgeable about the area and offered personal stories. After the tour, she took us to a local restaurant for a Hiroshima Okonimiyaki lunch. Yoshimi was a gracious, delightful hostess to her home town of Hiroshima. We spent the day visiting gardens, the castle, and Peace Park. Every step of the way, she illuminated the history of the spot and the people. A perfect introduction to a beautiful city. Yoshimi hosted my wife and I on a well paced tour of Hiroshima and the nearby island of Mirajima. She's a fluent English speaker making conversation easy. She is from the area and her personal stories adds a human touch to those horrific events. We had a great day and would highly recommend her to others. My husband and I had an excellent tour today with Yoshimi, her English, her knowledge of the places we visited and organisation could not be faulted. We would highly recommend her for tours of Hiroshima, thank you Yoshi for a wonderful day you are a gem. Yoshimi is amazing. She customized our tour and enjoyed it very much. Very knowledgable and accommodating of our schedule. Highly recommended. My tour guide Yoshimi was amazing. I was so looking forward to a fabulous tour. Yoshimi delivered that and much more. She was very informative and professional yet so friendly, like a long lost friend. My new friend from across the world. I will never forget the beauty she shared. She represented ToursByLocals extremely well. I will certainly recommend her and ToursByLocals to others. Yoshimi speaks excellent English and is very knowledgeable about history, but also general affairs in Japan. She is highly recommended as a tour guide. Absolutely wonderful day with Yoshi. Saw and experienced so much we'd never have done on our own. Yoshi is a fantastic guide - highly recommended. TOUR GUIDE RESPONSE: Thank YOU for sharing good time with me. Good luck with your marathons in Fukuchiyama and Kawaguchi lake! I hope you enjoy the river cruise in Kyoto and nice view in Mt.Fuji. Please come back to visit Naoshima someday. Good luck with Crag'study of physiotherapy at university!! Yoshima was a wonderful guide. Warm, friendly and full of information. We had a local lunch followed by a great afternoon on Miyajima. Thank you so much Yoshi. TOUR GUIDE RESPONSE: Thank YOU for sharing good time with me. I really enjoyed visiting the shrine and the Buddinst temple with you. Since all of you are British, I felt as if I was in the UK because of your Queens English. I will remember that Isabelle mentioned about the mosquito sound at the ferry boat pier for ever. Thank you very much again and please say hello to everyone! Wonderful time with one of the best guides we have ever booked with TBL. Would book again and send all our friends her way. I cannot recommend her highly enough! We had a fantastic day. Thank you! What makes this tour special is the guide. In this case Yoshi was unbelievable, she is from Hiroshima yet she is well travelled and her English is the best I have encountered. Yoshi puts a personal touch to the story of Hiroshima, and she has the ability to glide through the throngs of other people in a manner that takes away all of the usual stress of being in a busy tourist area. I recommend the tour to anyone wishing to experience Hiroshima.